LONDON - When defending Japan’s use of the death penalty, the government always cites overwhelming public support for the policy, and the last survey in 2009 showed 86 percent backed the status quo. But a major new study by an academic in Britain shows “serious flaws” in Tokyo’s assertion that the death penalty is universally popular and should therefore be maintained. Mai Sato, from Oxford University’s Centre for Criminology, shows that views are much less entrenched than previously thought, particularly after people have been exposed to more information on the subject. 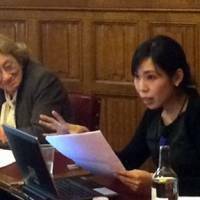 She recently presented her findings to the British Parliament’s group on the abolition of the death penalty, which, along with the Foreign Office, hopes the study will help contribute to a change of stance in Japan, one of the few developed democracies that still retain the practice. One of Sato’s main contentions is that questions used in government public opinion surveys are phrased in a way that results in an exaggerated level of support for the death penalty. Sato decided to conduct her own survey of around 20,000 people in Japan and gave respondents five options regarding the death penalty: should definitely be kept (44 percent), should probably be kept (36 percent), cannot say (16 percent), should probably be abolished (3 percent) and should definitely be abolished (1 percent). She argues the results show that rather than being overwhelmingly in favor, just over half of the Japanese public is either “undecided” or “lukewarm” toward the death penalty. Sato then decided to take 1,000 people from the survey and split them into two groups that each had an equal proportion of those in the pro, anti and undecided camps. The former would be provided with several facts about the death penalty — such as the execution process and the possibility of miscarriages of justice — while the other group would receive no additional information. The results said 36 percent supported retaining the death penalty in the first group versus 46 percent in the latter group. A final study saw a group of people deliberating the issue over a day. Findings showed views often fluctuated on the matter, while participants also become more tolerant of opposing views, said Sato. In an interview, Sato said that while governments should reflect public opinion, they also have a duty to protect human rights. Rather than measure support for the death penalty, Sato thinks the government should measure the level of tolerance toward abolition. She believes her research shows a majority of the Japanese public is likely to “accept or tolerate” abolition. Responding to the study, Louise Vischer, coordinator of the Asia Pacific Anti Death Penalty Project at Amnesty International, said the validity of opinion polls is flawed because of Japan’s lack of disclosure. “I question how opinion polls can be a fair judge when, in Japan, facts around the death penalty are kept secret. “The timing of conducting polls is critical. Support is known to decline when injustices or unfairness in death penalty cases hit the media, like the case of Iwao Hakamada, who is suffering from a mental illness after being on death row for 44 years following an unfair trial. This makes people feel uncomfortable,” he said. 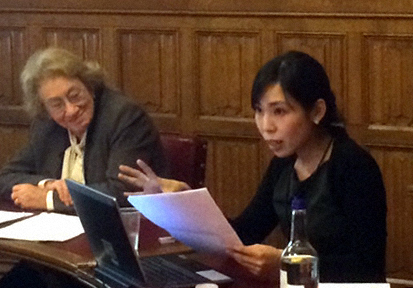 Vivien Stern, a member of Britain’s House of Lords who heads the group on the abolition of the death penalty, said she has an ongoing dialog with the Japanese Embassy in London and hopes this unique research will be influential.